History gives us a better answer. The ancient Turkish Akbash Dog has proven they can protect U.S. herds from wolves, coyotes and bears (yes, bears), without harming same wolves, coyotes and bears and may end up saving the wolves of Israel and Syria, as well. The Akbash Dog made its debut in American Agriculture in 1980 when then Secretary of Agriculture, Bob Berglund, announced at a press conference that the United States Department of Agriculture in Washington, D. C. had purchased several Akbash Dogs for evaluation and testing by its Livestock Guard Dog Program at the Sheep Experiment Station in Dubois, Idaho. This rancher's Akbash Dogs confronted the bears aggressively and significantly reduced his losses. By the early 1990s, the Akbash Dog had earned a reputation for being the only dog that routinely stood up to bears. Thus, two Akbash Dogs were selected for a test project in a Montana wilderness location where Grizzly bears were causing serious losses for a sheep rancher. The results of this project over a period of several summers were highly acclaimed by both sheep ranchers and environmentalists. The Akbash Dogs demonstrated their ability to reduce Grizzly predation without attacking or injuring the bears. Ranchers in other parts of the United States have reported that their Akbash Dogs have also deterred predation by wolves and mountain lions. Akbash in Turkish means white head... 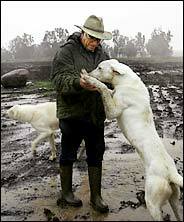 The Akbash Dog is found in rural country serving as a livestock protection dog in Turkey for millennia. The Akbash Dog is completely dedicated and devoted to its owners and any animals in its charge. These dogs possess intelligence and courage, making them natural guardians. Their independent nature allows them to respond swiftly and without guidance in an emergency. Their loyalty and protective instinct make them ideal home and estate guardians in addition to their more traditional role of guarding livestock. Due to their strong maternal instinct, Akbash Dogs begin to bond to other living creatures at a very early age. They have been known to form strong attachments to sheep, goats, cattle, horses and other livestock, to poultry or exotic birds, and other animals, and of course to people. Once bonded, even without specialized training, the dogs will not hesitate to come to the rescue of their charges if they think they are in danger, even at the risk of their own lives. Protected animals often show great trust and loyalty to their canine guardians. In fact, vigorous and inventive programs by Israeli and Arab conservationists are underway to stabilize and restore endangered animal populations, as NATURE highlights in LOST WORLD OF THE HOLY LAND. This picture that shows "...some of the Akbash dogs that protect the cattle of Kibbutz Merom Golan from wolves, and the wolves from being shot. " That's Arab and Israeli conservationists working together to save the wolves of the Golan Heights. (They may not agree about the land, but they do about the endangered species living there). So, why is the U.S. Fish and Wildlife Service changing the status of Gray Wolf to allow trophy hunting? Are they trying to put it back on the endangered list? Gov. C.L. ``Butch'' Otter told The Associated Press that he wants hunters to kill about 550 gray wolves. That would leave about 100 wolves, or 10 packs, according to a population estimate by state wildlife officials. The 100 surviving wolves would be the minimum before the animals could again be considered endangered. 550 gray wolves. That's 55 packs (families) that someone intends to put on their mantle to give them first shot at elk (to put on their mantle). Studies on wolf predation in Yellowstone have shown both the elk and the general ecology benefit from predation avoidance behavior's impact on grazing patterns. Also, if you happen to know any ranchers experiencing herd degradation due to wolves and/or other wildlife, please tell them about the Akbash Dog. There are breeders and rescue organizations working to get these dogs placed with herds.